This iron door is one of our recent installs in Danville, CA. 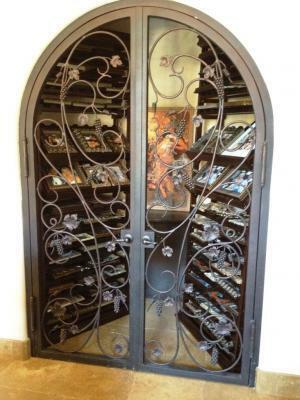 There is no better way to showcase your collection of unique one of a kind wines, than with a unique iron wine door thats sure to impress. Our iron wine doors are durable and long lasting, yet elegant and dramatic. We can create a custom finish to match your iron wine door to your Iron entry door and ornamental iron railing, allowing you to tie your home together and give it the sophisticated look you deserve. Signature Iron Doors is dedicated to helping you with any of your iron needs and we will continue to provide our customers with a high quality product matched with fantastic customer service.